Michelangelo is the most celebrated of all visual artists, and one of the few who are admired in equal measure for sculpture, painting, and architecture. Perhaps it should come as no surprise that he was also a great poet. In fact he was, without much doubt, the greatest lyric poet of his time in the Italian language. In every field of art, fate supplied him with the best imaginable models. In sculpture, his forebears were Donatello and Ghiberti; in architecture, Brunelleschi, Alberti, Sangallo, and Bramante; in painting, Botticelli, Bellini, Mantegna, and Leonardo; and in poetry, Dante, Cavalcanti, and Petrarch. He knew the work of all these masters at first hand. Yet in each of these arts he also took new risks and followed paths that no one else had taken. Poetry in Michelangelo’s time was a more private art than painting. Poems circulated mostly in manuscript, often among the members of private clubs devoted to literature and conversation. They were also used to curry favor. Michelangelo was not a clubbish sort of person, nor did he ever write a fawning dedication, seeking the patronage of the wealthy – but he did sometimes enclose handwritten poems with the letters and sketches he sent to a few close friends. He treated his poems casually – very much like sketches rather than finished works of art – and they remained uncollected and unpublished for seventy years after his death. When they did appear in print, in 1623, they had been heavily censored and bowdlerized by their editor, Michelangelo’s grand-nephew. Perhaps that too is no surprise. Though he was showered with praise in his lifetime, and has been honored ever since, Michelangelo’s work has always seemed too potent to some observers. Less than a year after his death, drapery was painted over the crotches of the figures in his powerful Last Judgement, in the Sistine Chapel – and much of that drapery was retained, even when the Sistine frescoes received a zealous cleaning beginning in 1984. The genitalia of his sculpture of the risen Christ, in Santa Maria sopra Minerva, have also been covered since the sixteenth century by a heavy bronze loincloth. No uncensored edition of his poems appeared until 1893, three centuries after his death. About 300 of his poems survive. Many are sonnets, but most are in a more supple form known as the madrigal. Among the best are a group composed when Michelangelo was in his sixties. These are poems written for or about Vittoria Colonna, evidently the only woman whom the adult Michelangelo ever loved. They speak with great strength and tenderness of loneliness and love, of the power of art, and of the hard, high-country stone in which the artist loved to work. Ten of these late, great poems are published here, in the original Italian, with Robert Bringhurst’s exquisite new translations. They are indeed like sketches – and anyone who has been lucky enough to see Michelangelo’s sketches in the flesh will know that nothing could be better. 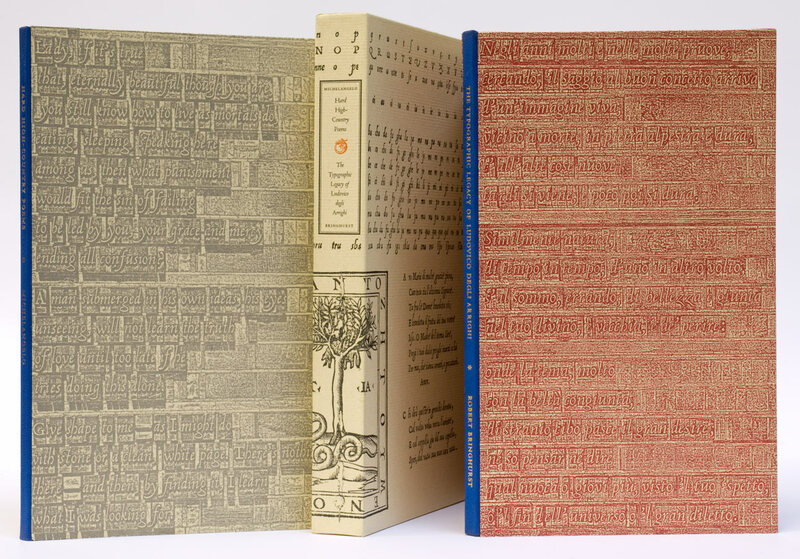 The Italian texts of Michelangelo’s poems, Bringhurst’s English translations, and his accompanying essay are all set in fonts that are descended from the chancery italics designed in the 1520s by the brilliant but short-lived calligrapher and printer Ludovico degli Arrighi. Michelangelo and Arrighi were not far apart in age. Early in the sixteenth century, they both spent several years in Rome, both working for the Vatican, and may have known one another at that time. In 1517, Arrighi also executed a large and important calligraphic commission for Vittoria Colonna – the woman who became, two decades later, Michelangelo’s closest friend. Typographic historians routinely mention Arrighi, but few have understood his real importance to the field. 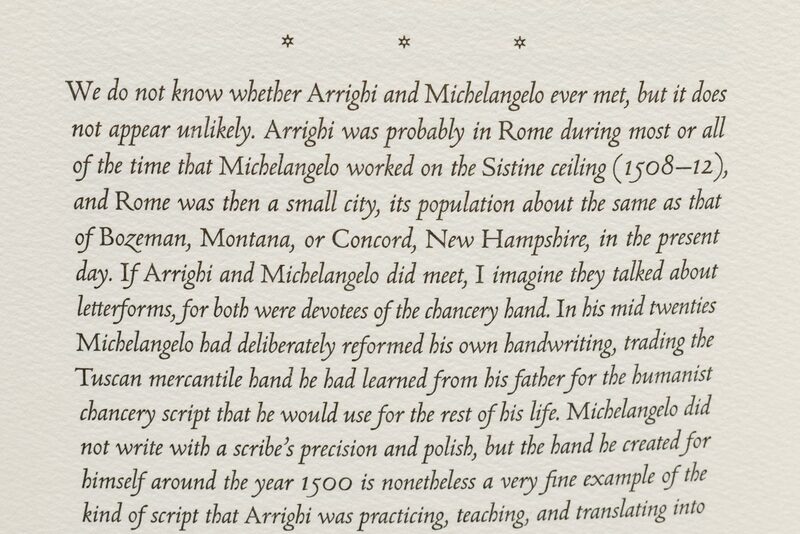 Bringhurst makes an excellent case for considering Arrighi to be the world’s first type designer in the modern sense of the word: the first skilled calligrapher who drew letters specifically for punchcutters to cut, just as Baskerville and Van Krimpen, Dwiggins and Zapf would do centuries later. Arrighi was also the first professional calligrapher to become a letterpress printer and publisher, and the only major type designer who devoted himself exclusively to italic. Several important revivals of Arrighi’s type were produced in England and France between 1923 and 1930. Since that time, the story of these fonts has been told repeatedly, but in many different ways. Stanley Morison and Frederic Warde, who were personally involved, left highly contradictory accounts, and several later writers have muddled the story further. Bringhurst’s 27-page essay peels away layers of misinformation and confusion, setting the record straight at last. 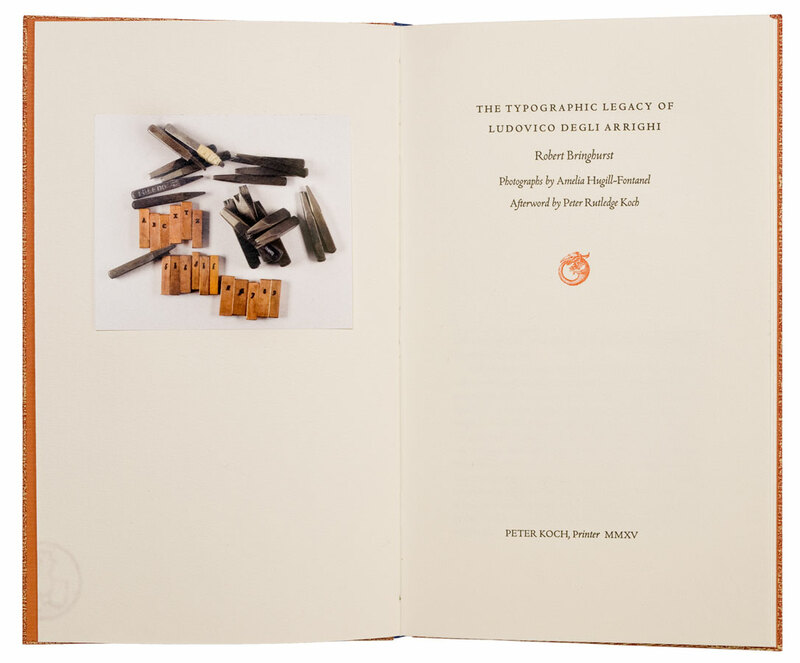 An afterword by Peter Rutledge Koch describes the provenance of the rare typefaces used to print the poems as well as the legendary printing press used to print the books. The essay is illustrated with two tipped-in photo-reproductions of the punches, from photographs by Amelia Hugill-Fontanel. A publication of poetic works of unquestioned stature and universal appeal certainly requires no accompanying image. 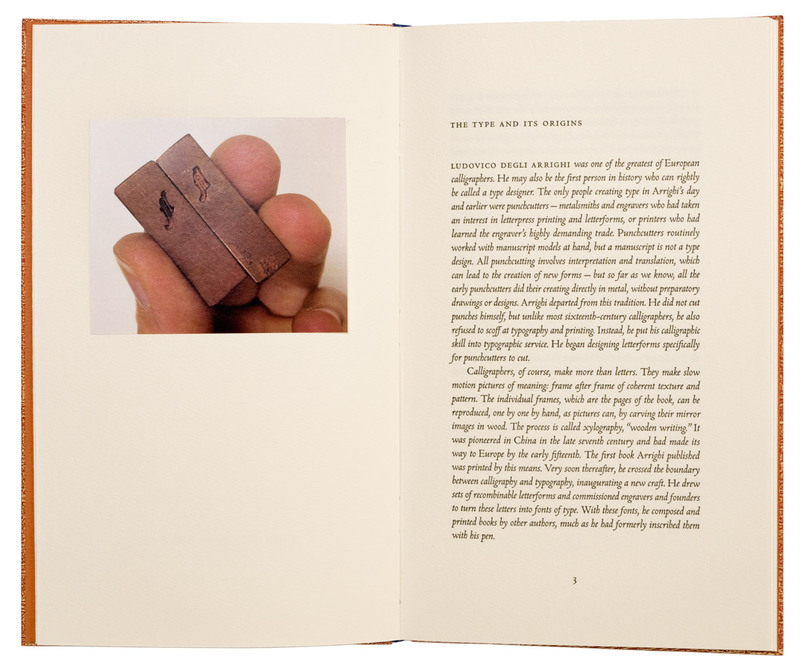 Yet, an introductory pictorial ‘exclamation mark’ seemed appropriate for this special edition, given that the poet is also one of the giants of visual art. Michelangelo’s portrait by Joseph Goldyne, executed as a drypoint, intentionally takes its cues from the rare drawing of the artist by his friend and follower, Daniele da Volterra in the collection of the Teylers museum, Haarlem. The drypoint aims for both strength and delicacy, a contemporary graphic homage reflecting qualities that characterize its sixteenth-century subject’s most enduring creations. Hard High-Country Poems was designed & printed on the Gietz Universal platen press by Peter Koch with the assistance of Jonathan Gerken. The Italian was composed by Michael Bixler in Monotype Arrighi and printed directly from the metal type. Bringhurst’s translation was handset by Mark Livingston from original foundry Vicenza & Arrighi types cut in 1925-26 by Charles Plumet for Frederic Warde. The preface and colophon pages were composed in a custom digital version of Monotype foundry Arrighi and printed from photo-polymer plates. 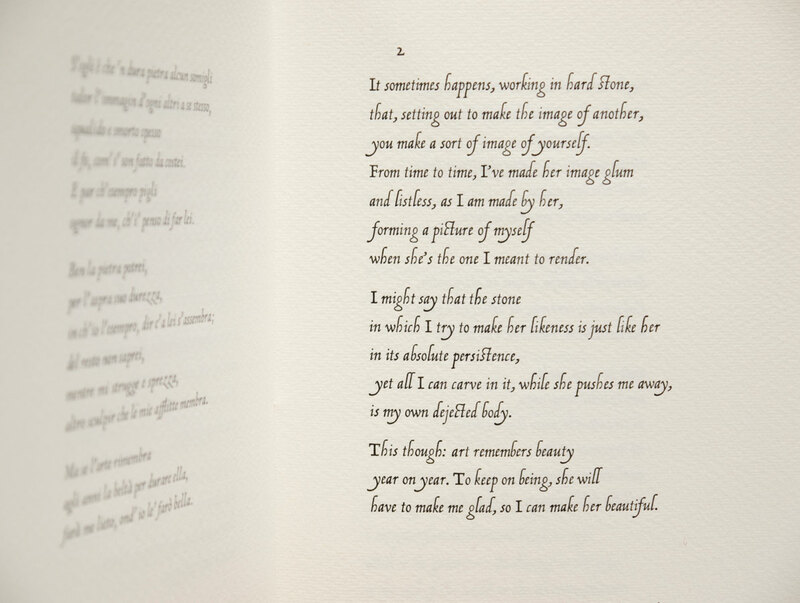 The poems are printed on vintage Amalfi Amatruda handmade paper. 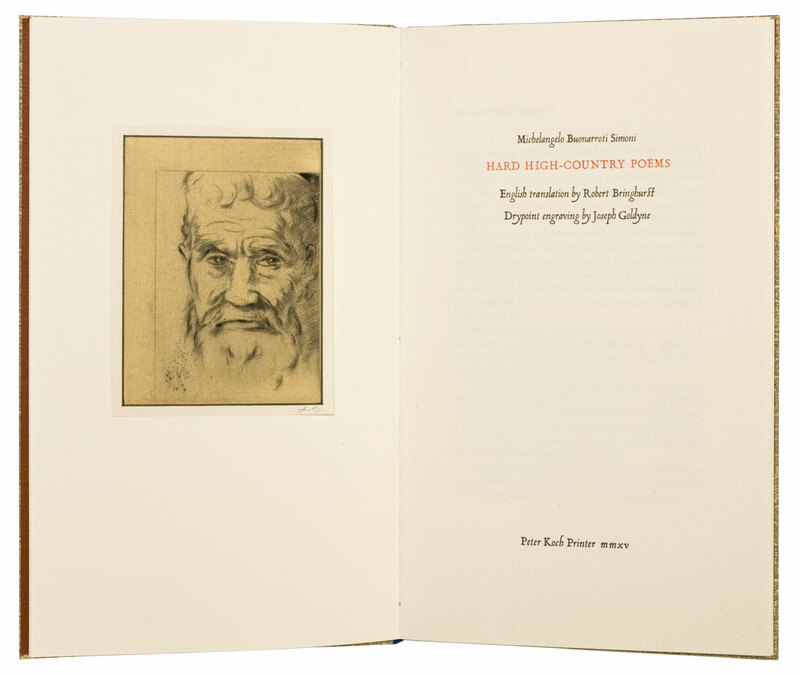 The frontispiece, a drypoint portrait of Michelangelo by Joseph Goldyne, was printed by Robert Townsend. The Typographic Legacy of Ludovico degli Arrighi, published to accompany Hard High-Country Poems, is set in custom-made digital variants of foundry Monotype Arrighi and Centaur types and printed letterpress from polymer plates on Hahnemühle Biblio paper. On the binding: the cover wrappers are derived from photographs of standing type-metal forms used to print the poems. The slipcase is covered in a reproduction of the rare Ludovico degli Arrighi. Type specimen sheet, [Vicenza : Tolomeo Janiculo, 1529] courtesy of the Book Arts Collection, Rare Book & Manuscript Library, Columbia University. Slipcase & binding in quarter leather and printed paper over boards by John DeMerritt Bookbinder. 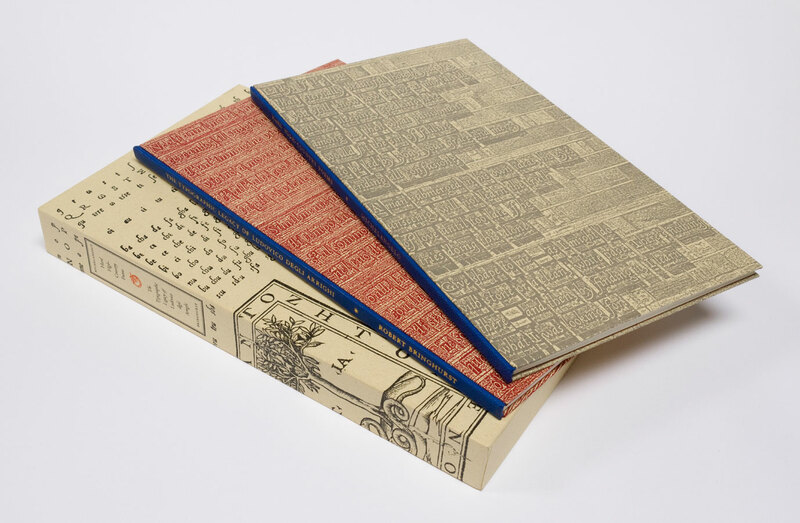 The edition is limited to 126 slipcased sets, 112 of which are numbered, ten artist’s proofs designated A/P 1 - 10 and four printers proofs designated P/P 1 - 4.